IE: Xerox, Canon, Konica Minolta, Ricoh, Océ, Toshiba, Kyocera Mita, Savin, Gestetner, Lanier, Danka, Ikon, Imagistics-Pitney Bowes, Develop, Agfa, Panasonic, Rex Rotary, and MORE. The Factory Media Kits we offer include. EFI Fiery System Recovery Software. Available for both High End Tower Copier Controllers & Economy Bustled Units. EFI Fiery User & Administration Documentation. All the latest Fiery User Drivers for both PC & MAC. The Latest Fiery Operating System Updates. Fiery Color Calibration Kit (Color Units Only). The latest EFI Fiery Command Workstation. The latest Fiery Application Packages. - YOU MUST ALREADY HAVE THE FIERY SERVER FOR YOUR PHOTOCOPIER TO USE ANY OF THE MEDIA KITS BEING OFFERED HERE -- THESE ARE SEALED ORIGINAL FACTORY MEDIA KITS -- NOT BOOTLEGGED COPIES OR DUPLICATES. Media Packs Include: One to several Utility CD's. The User Software CD/DVD(s) typically include these software packages: Command Workstation for both PC/MAC, Virtual Drum Scanner, Colorwise Pro, ColorGear, FIERY Link, FIERY ICM/ICC Profiles, FIERY Font Utilities, Print Port Setup Utilities, FIERY Calibrator, FIERY Downloader, FIERY Spooler and PC/MAC Drivers Includes the latest Windows & MacOSX Drivers! , There are commonly six manuals of 200+ pages each concerning complete FIERY Setup and Maintenance: Getting Started, Configuration Guide, Administrator Guide, Printing Guide, Job Management Guide & Color Guide. Some Media Packs include these manuals in PDF format only on CD. Black and White FIERY models sometimes include less printed material and software packages due to the lack of color related documentation necessary for controller operation. This kit is imperative to own in order to successfully operate any EFI Fiery controller. 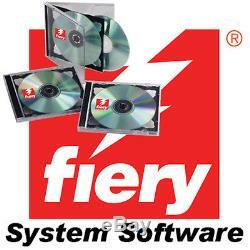 FIERY System Recovery Software CD/DVD(s). These CD/DVD(s) allow you to reinstall the FIERY operating system software on the FIERY controller itself in the incident that the unit becomes corrupt or bugged. It also allows you to install a new hard drive in that machine if the current one fails or if you want to upgrade to a faster or larger capacity hard drive. If the FIERY is failing in any way, erasing the system and re-installing the system software can repair it a majority of the time. NOTE: These are separate CD/DVD(s) from the client side CD or "User Software" CD that contains the "Command Workstation/Drivers/Utilities" for your PC/MAC peers that are connected and have network access to the FIERY unit(s). Not all Media Packs are compiled of the same volume of documentation and software components due to the nature and flexibility of each given controller; thus, volume of media pack contents may vary. With only a few exceptions, each controller requires its own unique media pack. LANgrafix also assumes no responsibility in any given user's ability to use the media pack properly, and due to rare scenario of customer misuse, we must openly state use, install and operate media pack contents at your own risk. All sales on media packs are final so please chose media pack type wisely. We are putting up a lot of Fiery controllers & Media Kits like this, so bookmark us! Below is who we are by the way, so see for yourself our custom specialties and the company quality you would be purchasing items from. North America's ONLY Fiery-DIRECT Copier Controller Repair and Wholesaler specializing in EFI FIERY, ColorPASS, EDOX, AHT. Scitex Servers for Canon, Xerox, Konica-Minolta, Ricoh, Sharp, Kyocera. Toshiba, and many other makes of B/W Copiers, Color Copiers and Wide-Format Printers. DON'T FORGET TO TAKE A LOOK AT OUR OTHER AUCTIONS! Check these links to find out. The item "Konica Minolta Bustled FIERY IC-409 Controller (SOFTWARE) -Bizhub C650 C550 C451" is in sale since Friday, August 24, 2012. This item is in the category "Business & Industrial\Office\Office Equipment\Copiers\Copiers". The seller is "langrafix-fiery-controllers" and is located in South Elgin, Illinois. This item can be shipped worldwide.